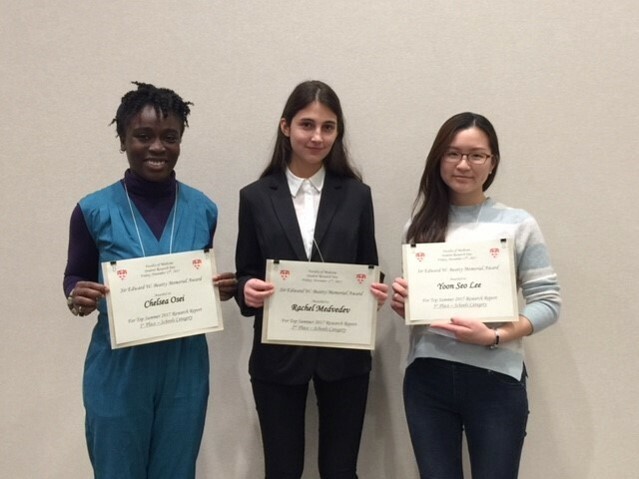 At the 2017 edition of the Faculty of Medicine Student Research Day, McGill SPOT Physiotherapy Students were well represented, winning three Sir Edward W. Beatty Memorial Final Report Awards. Ali Alias was awarded the Best Winter 2017 Research Report, Rachel Medvedev was awarded 2nd Place (Schools Category), Top Summer 2017 Research Report, and Yoon Seo Lee, was awarded 3rd Place (Schools Category), Top Summer 2017 Research Project. The Student Research Day was held in November; students in the McGill Summer Research Bursary Program were able to present their work among peers, faculty members, guests, and judges. Also shown in the photo is Chelsea Osei from Speech-Language Pathology; absent is Ali Alias.